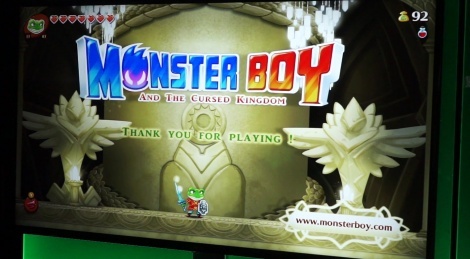 Miguel just came back from the (rather poor) showfloor of this Gamescom with 2 videos of Monster Boy And The Cursed Kingdom. It actually looks rather nice ! That looks absolutely lovely, do want ! Hope this one will be long at least as Wonder Boy V.. and gets a phisical version.. I noticed that too, I can't wait for this game, instant buy from me just to see it on my 4k tv with all the vibrant color. That's the type of "remakes" companies need to do more (even if it qualifies more as a sequel than a remake). Not just upping resolution and slapping "Remaster" on their previous gen games. Now can we have Thunder Force VII or at least a remake of TFIV please ? My 5 year old will love this! When is it out?